Great quality and fit, well made and the red RST really shows well. I'd definitely consider buying another or buying as a gift for someone. Excellent value for money from the RST range again. Very happy with the product, and as always very happy with Sportsbikeshop. Very comfortable snug warm beanie. Very well made and washable. Consider it excellent value for money and a great service from Sportsbikeshop. Can't imagine who would need the smaller size, but happy to recommend this Beanie! Wore this over the Xmas period playing snooker in my father in-laws garage. Happy to recommend to anyone who likes the RST brand. As ALWAYS, great service from Sportsbikeshop!! Simply RST! Superb price quality! And again like always, very good service from Sportsbikeshop! Quality little beanie. 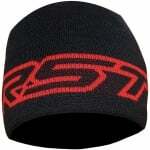 Really keeps your head warm and looks great too. Top quality product and first class service once again. Yet another great RST product. No complaints, gets the job done. Head is kept warm. RST never let you down, good price quality product.